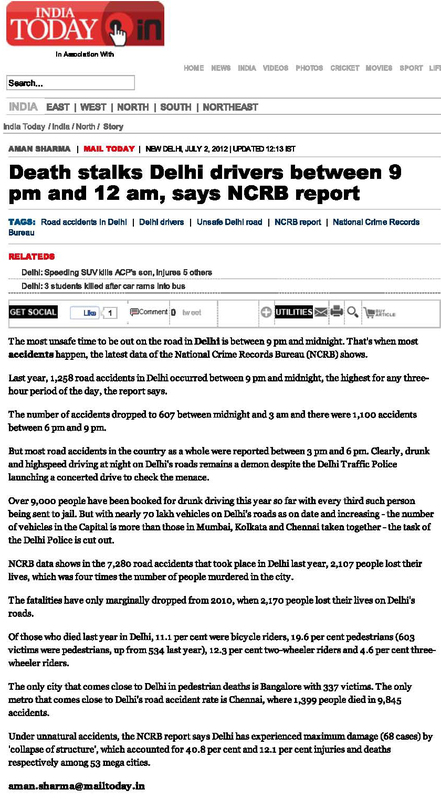 Delhi cyclists and pedestrians most vulnerable to accidents between, 9pm and 12am. 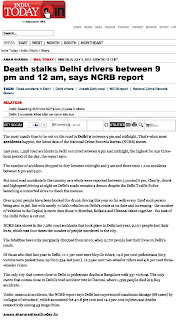 Original Headline: "Death stalks Delhi drivers between 9pm and 12am, says NCRB report"
The Urban Development Ministry has told the Delhi Metro to ensure bicycle stands and proper pedestrian facilities along Metro stations under Phase-III. 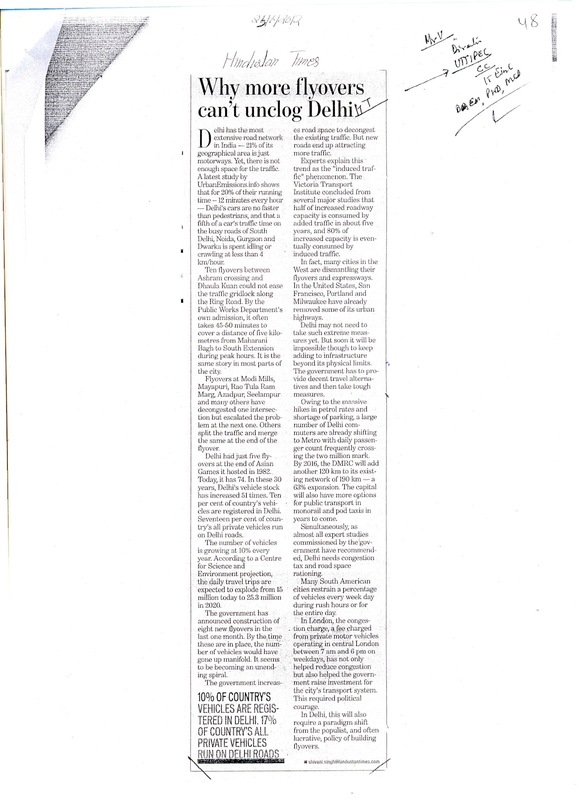 This has been proposed to ensure proper last mile connectivity from the Metro stations, said UD officials. 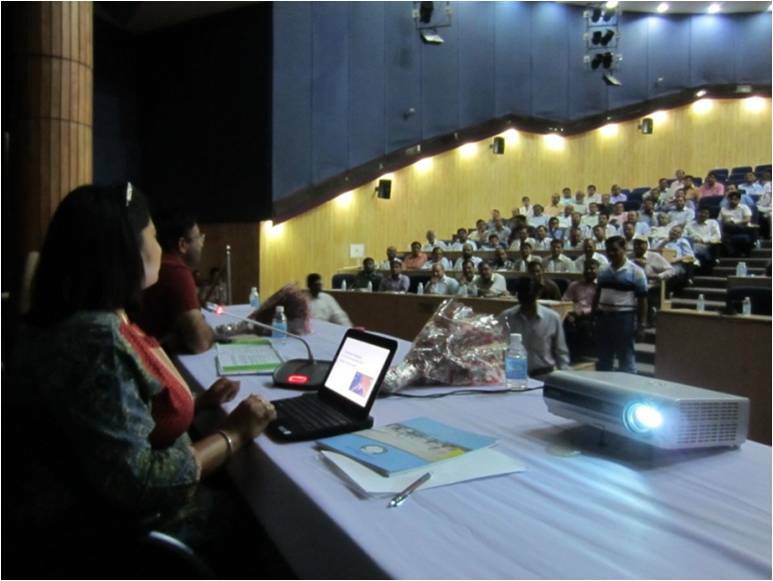 “We have asked the Delhi Metro to have bicycle stands near Metro stations as part of Phase-III of the project. Also, the civic agencies should work with Metro to have proper non-motorised vehicles and footpaths on all roads in the city. 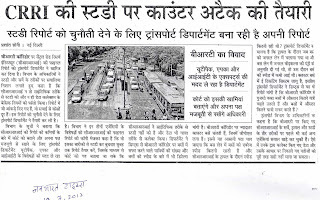 Delhi Metro has assured us that they are working on this,’’ said a UD official. The ministry also wants all the Metro to generate funds and cut dependence on loans and budget allocations “Depots need space only on the ground floor, so upper floors can be used for hotels,etc. These places will also be close to city centres and have ample parking,’’ said a senior UD official. 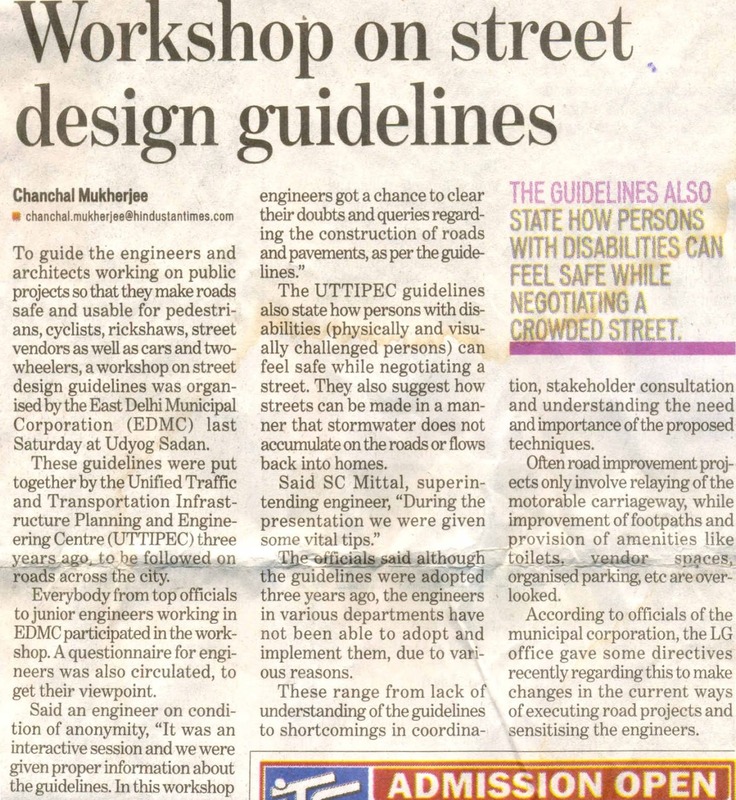 A week ago, the EDMC conducted a sensitisation workshop for all its engineers for the implementation of Street Design Guidelines of the Unified Traffic and Transportation Infrastructure (Planning and Engineering) Centre. This was in acco- rdance with the directive iss-ued earlier by the office of the Lieutenant-Governor and the Chief Secretary to all civic bodies to make changes in the current ways of executing road projects and to conform to the UTTIPEC guidelines. Following a meeting on on-street parking, Mr. Yadav said that the Public Works Department is in-charge of implementing the new plan for on-street parking on Vikas Marg and the Corporation will support the same. 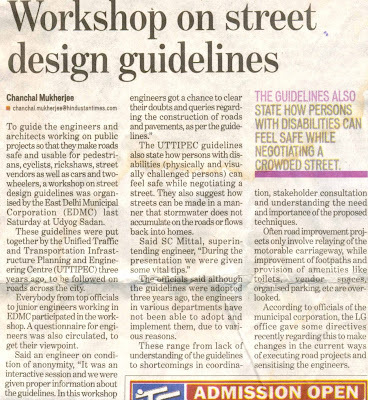 In 2009, the UTTIPEC had issued Street Design Guidelines to be followed on all city’s roads to make them safe and user friendly to all road users such as street vendors, pedestrians, women and children. The guidelines also provide ways in which persons with disabilities could be made to feel safe in negotiating a street. NEW DELHI: With parking turning out to be premium in the city, the Delhi government is looking for ways for better management of parking lots. At a recently held meeting of the court-appointed special task force (STF) on traffic, the umbrella transport agency UTTIPEC made a presentation for a pilot project. 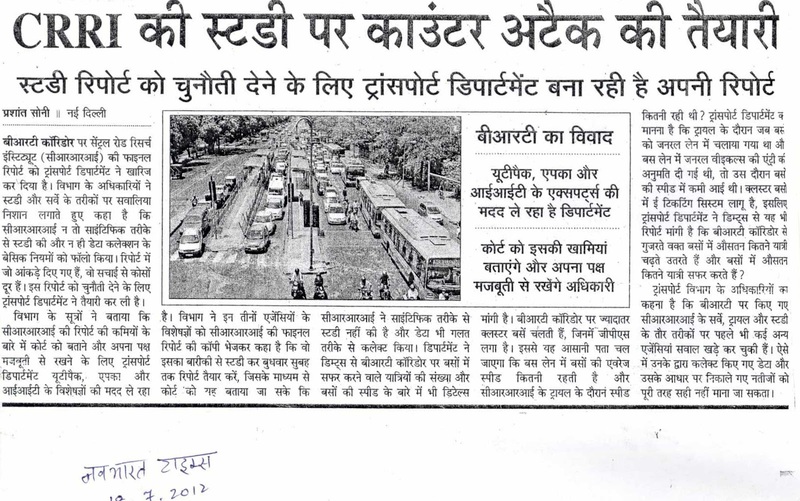 The project, which will look to provide short-term and long-term parking solutions, will be undertaken on Vikas Marg. 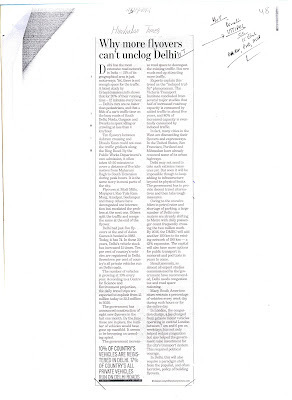 If successful, a senior government official said, the project may be replicated across the city. "The project will be carried out after identifying on-surface parking for those who need to park for short-term like shoppers who come for an hour at most. The other kind of parking which may be an underground multi-level parking will be used for those who need to park for long-term. This includes the shopkeepers and residents of the area," an official said. The proposal has got an in-principle approval from the L-G, said sources and the finer details of the project are being worked out. Besides differential time slabs, suggestions have been made to keep a free parking zone for non-motorized vehicles and para-transit near the Metro stations. Parking for other vehicles would be demarcated from the station, said a source.